Police Care UK is here for serving and former officers, staff, and volunteers, as well as their families, and provides independent, confidential, and free to access support thanks to donations and fundraising – we receive no Government or police funding.We provide practical, emotional, and financial for those who suffer physical and psychological harm because of their policing role. Our mission is simple: to reduce the impact of harm on police and their families. We raise awareness, support recovery, and reduce harm in frontline policing.Police Care UK – rebuilding lives for a brighter future. Every day the police find themselves in harm's way protecting the public. 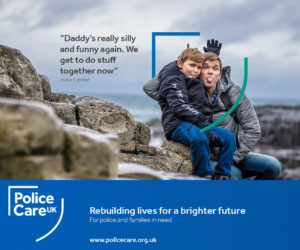 Police Care UK, the charity for police and families, has launched it's care framework to make sure both serving and former colleagues who suffer harm, and their families, have someone to turn to when things get tough. Through practical, emotional, financial support that is free, confidential, and independent, we're building a future where no-one suffering harm is left without help. Find out what we're doing to deliver welfare that works for the most important resource in modern policing - it's people.